The Global Internet (GI) Symposium is the flagship event established and organized by the Internet Technical Committee (ITC), a joint committee of the IEEE Communications Society (ComSoc) and the Internet Society (ISOC). 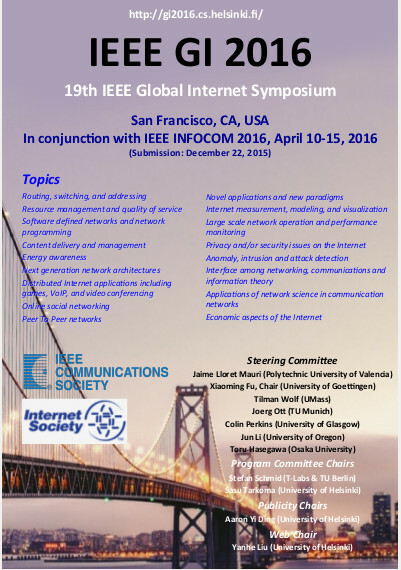 The 19th IEEE Global Internet Symposium will be collocated with IEEE INFOCOM 2016. All relevant dates, location, and travel information are available from the IEEE INFOCOM 2016 conference site: http://infocom2016.ieee-infocom.org/. The IEEE Global Internet Symposium aims to provide a top forum for researchers and practitioners to present and discuss advances in Internet related technologies. The focus of the symposium is on experimental systems and emerging future Internet technologies, and especially on scaling such systems to a global scale. Research on understanding Internet protocols, services, and applications at global scale is also encouraged. The Program Committee also welcomes position papers (which should be clearly marked as such). © IEEE GI 2016. Powered by Bootstrap.